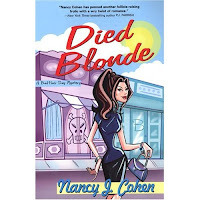 I bought Died Blonde by Nancy J Cohen at a thrift store because I liked the cover and the title was cute. I have never heard of the author before. I thought it might be a cute story for a winter night. The premise is Marla owner of Cut 'N Dye salon finds her competitor, Carolyn, murdered in the utility room of the mall they work in. Detective Vail, Marla's boyfriend, asks her to help him with the case because of her ability to get people to talk (I'll get to that). It seems that Carolyn had an endless line-up of people who were willing to whack her. Marla has her work cut out for her. Top of the list is a bitter sister, a shifty lawyer, a flighty psychic and a secretive chiropractor. Could one of them have done it? First off, I didn't find Marla particularly appealing. She had a very abrupt manner, maybe this was to emphasize how she is a very serious business woman, I don't know. As for her ability to get people to talk, to me it went like this: "Hey you, did you kill that woman?" "No, but please sit and I'll tell you my whole life story. I was born in a small town..." She might not have had a sparkling personality but she had a lot of baggage. The Titanic could have sank just loading it on board. I didn't like how she was with her boyfriend- does she love him or not? I couldn't tell you. I knew the murderer as soon as that person appeared. There was a huge info-dump at the psychic's house. The purpose, I'm guessing, is to get you to read the next book to see if the psychic was right or not. Maybe it takes reading the other books to warm up to Marla. Maybe that was the problem for me. There were some interesting characters, like the mom and best friend. The pace, for the most part, was right and the ending was quite intense. Everything was wrapped up nicely with no loose ends, just a hint of what's in the next book. All in all, it wasn't the worst thing I've ever read.